I have created a one layer masculine card for a man that’s a bit of a rebel. Ha! 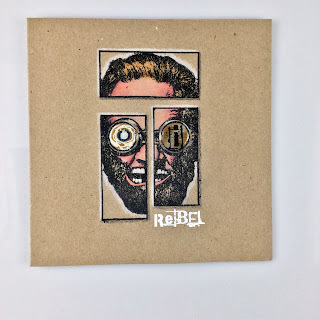 Who doesn’t love a rebel, eh? 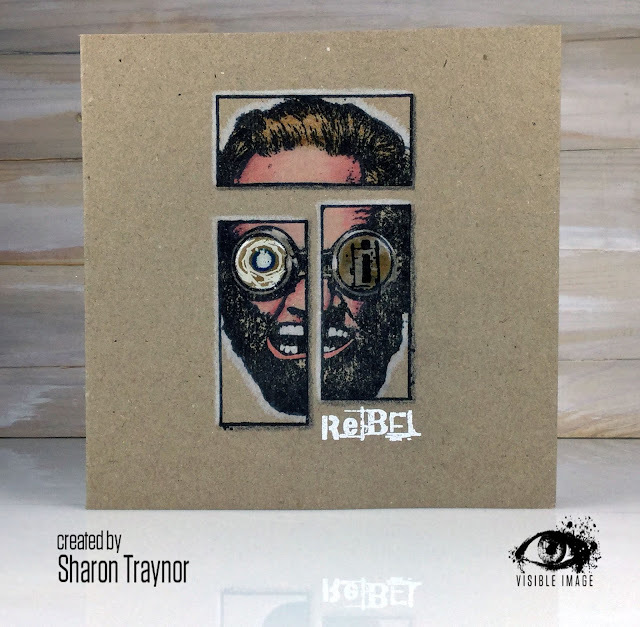 This card has been made using another of the new stamp sets from the Visible Image February release, and this set of stamps is perfect for fun and funky masculine cards. 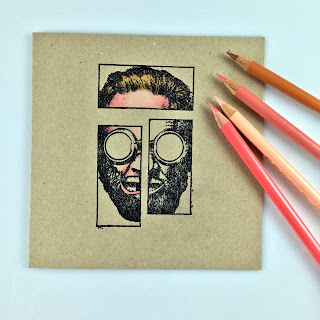 There are loads of smaller stamps in the set, including some brilliant fish, but I decided to do some pencil colouring on kraft card using these wonderful face stamps. The face design is so unique, isn’t it? One good thing about making CAS cards is that they are simple to re-create. Just as well really because I had to recreate this one as I’d made the first one (above) without photographing the step-by-step. 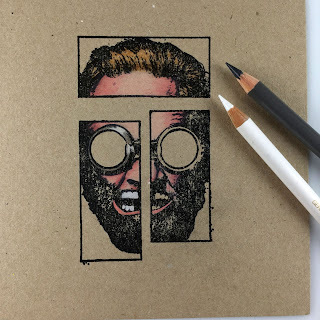 First, stamp the image onto a kraft card blank in versamark black ink. Add a little grey shading on the bottom and right side of each rectangle. This gives the illusion that the rectangles have been 3D’d. Next stamp the images into the goggles. 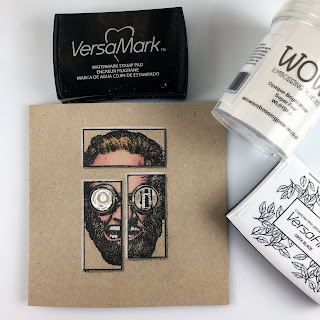 Stamp the right eye in black ink, and the left eye in versamark clear. 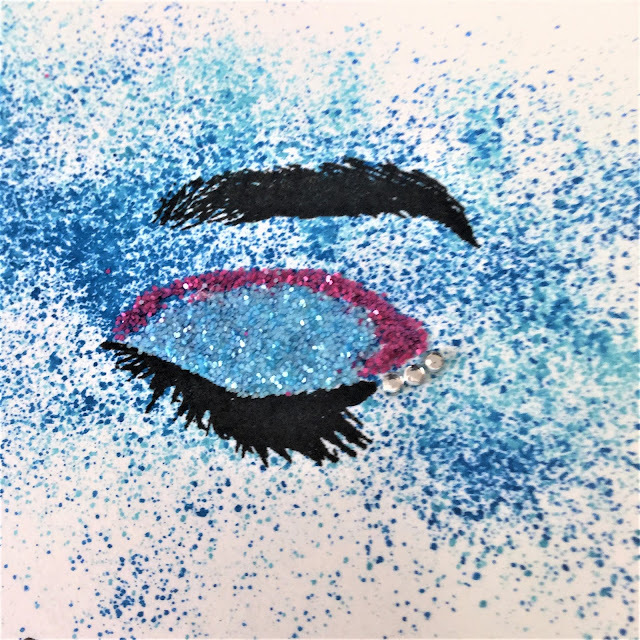 Add white embossing powder to the left eye, then brush the excess powder away from the outside to reveal the edges of the goggle, and heat emboss the central part of that eye. When cooled add some blue pencil to create a wacky eyeball. Here’s where I diverted from my original card. I added glossy accents to the goggles. In hindsight I really wish I hadn’t, as I much prefer the original card I made. One thing I forgot to do though was add that white pencil shading around the edges of the head. This makes the head pop off the page. You can see here how the glossy accents really affected the right eye so that you can’t see the white pencil I added to it. Anyway, lesson learnt. Finally heat emboss the ‘rebel’ sentiment in white embossing powder. 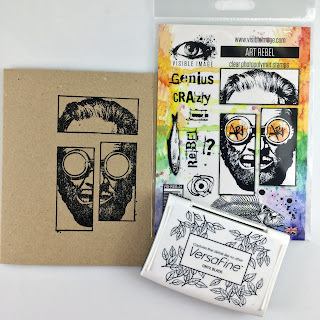 Versafine onyx black ink, Versamark clear ink, Wow opaque bright white embossing powder, Glossy Accents, Polychromos pencils, kraft card. Thanks for stopping by today, I’ll be back soon! This week I have a whole gift set made with the fantastic ‘One Kind Word‘ stamp set. I just couldn’t stop myself from going crazy and making a whole coordinating gift set for Valentines day! I really love how pretty this set looks. And it is so easy to create these too, once you see how to make the heart shape, which actually is incredibly simple to do! Just stamp the image once Then rotate and stamp again. (The black lines in the second photo below shows the side of the stamp that I rotated and how it matched up to the first stamped image). Easy peasy! 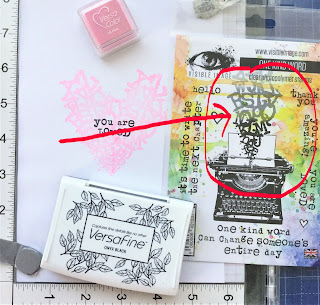 To make the card, I stamped the typewriter and the sentiment in black ink, then stamped the heart (using the method in the photos above) over the typewriter in a pink ink. The smallest heart from the stamp set was stamped a few times around the border and a little doodling added before mounting onto coordinating pink and black paper, and then affixing to a card blank. On the envelope flap I stamped the heart shape again and added the ‘You Are Loved’ sentiment. The wrapping paper was made by sticking some sheets of printer paper together and stamping the heart shape in a repeating pattern all over the paper. The sentiment was stamped into the middle of the hearts on one row, missing the next row and stamping it again in the hearts of the row underneath, continuing like that on each alternate row until the last row on the paper. 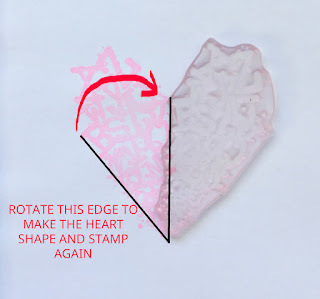 Then a smaller heart was stamped into some of the gaps in a regular pattern across the paper. The gift tag was made by heat embossing onto black paper and fussy cutting out into a heart shape. That was then attached to white card and fussy cut to make to give a white border, and the back of the tag would then be easy to write on. An eyelet was added and the tag attached to the present with black ribbon and a few pink flowers to match. Versafine onxy black ink, Versacolor 33 pink ink, Versamark clear ink, WOW! 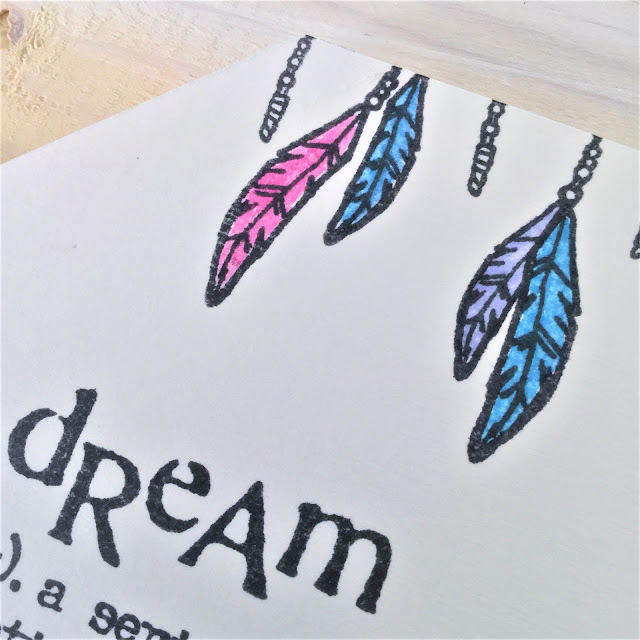 opaque bright white embossing powder, Black micron pen, misti stamping tool, printer paper, black ribbon, pink flowers, black & pink paper and white card. I do hope you like this set and that you will pop by again soon. Clever card design and gorgeous wrapping paper too. Thank you! 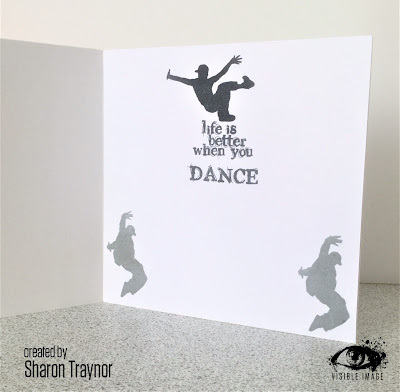 You will find more of Sharon’s fabulous cards and projects over on her blog. So I will, but first I want to share with you how I created this page and I can do so by sharing the video tutorial I made. Enjoy! We’ll be back tomorrow with gorgeous inspiration from Sharon and Pauline! I’ve been very kind to you today because my card only uses one stamp set and just a few other supplies. 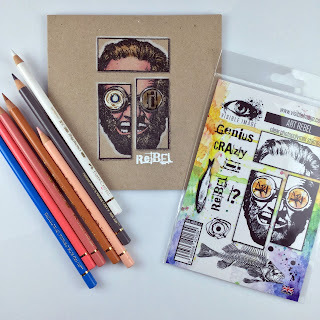 You really don’t need a ton of supplies to be able to create something beautiful with this amazing stamp set from Visible Image. This beautiful hummingbird stamp was just crying out for some gorgeous blue and green colours and I just couldn’t resist a bit of water colour drippage too. The amazing black twinkle embossing powder also gives this gorgeous bird a wonderful shimmer. I hope you like it as much as I do. 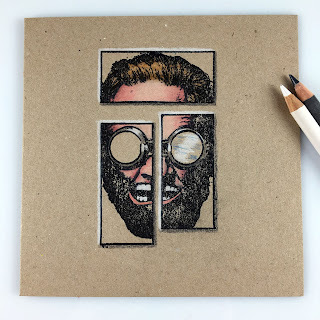 How to make this card. Stamp the hummingbird stamp in black ink onto white card using a stamp positioner tool such as a Misti. Leave the stamp on the door of the stamp positioner. 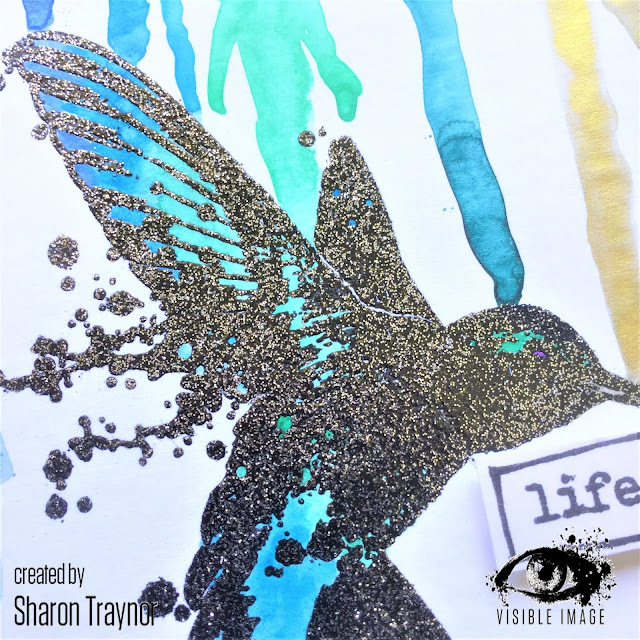 Paint the hummingbird using Gansai Tambi water colour paints. 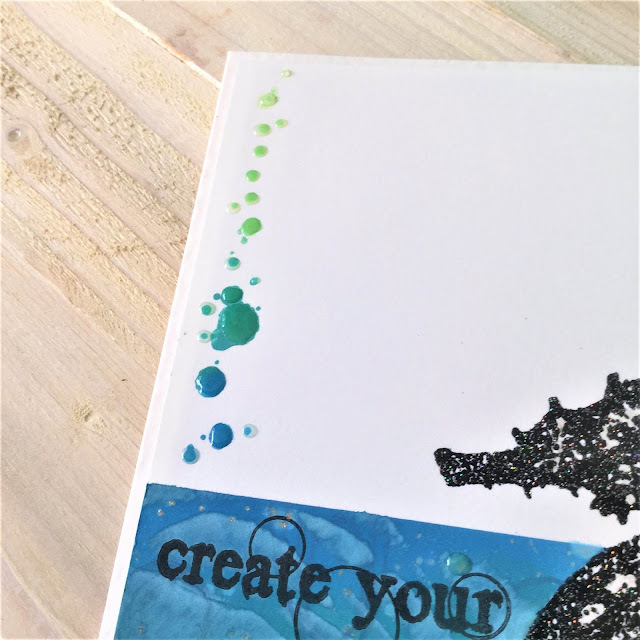 Paint clear water onto the card where you want the drips to appear, trying to match up the drips with colours used on the hummingbird. Add the paint to the top of the card for each individual drip and let it run down towards the bird. Set aside to dry. 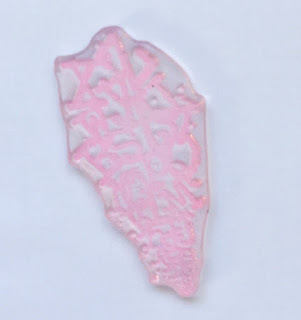 Once dry, use an antistatic pad on the panel and re-stamp the bird again in versamark ink (that’s why you needed to leave the stamp in your stamping tool!) and heat emboss with a sparkly black embossing glitter. Mount the panel onto gold card and add a couple of additional thin strips of the card for some added interest. Mount the panel onto a card blank. Stamp the words onto spare white card, cut them out and mount them to the panel with 3d foam. Here’s a close-up where you can catch how sparkly the embossing glitter is. Versafine Onyx Black ink. Kuretake Gansai Tambi Watercolours (No50 pale aqua, No55 green, No61 cornflower blue, No62 cobalt blue, No64 blue, No91 bluish gold), Versamark clear ink, WOW! black twinkle embossing glitter, white card, gold card. We will be back later with fantastic inspiration from Pauline! Good Afternoon! Thanking you for visiting our blog today! 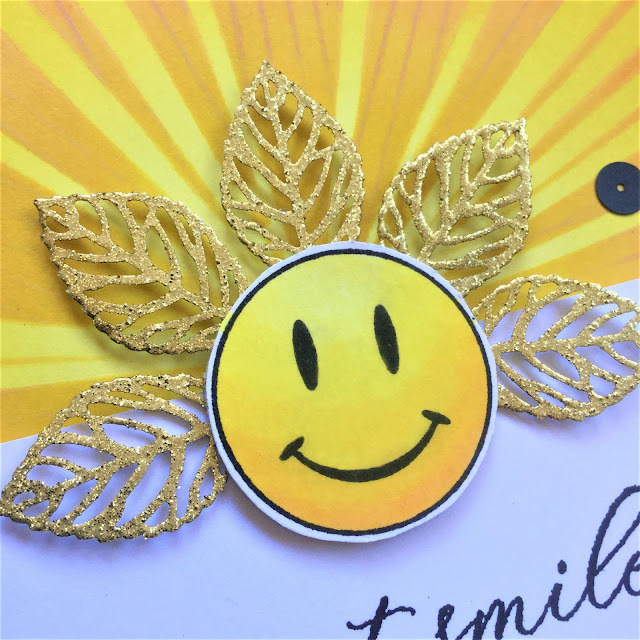 Sharon Traynor has got her hands on some of our new stamps and has created a very happy card featuring one of the smiley face emoji stamps from our ‘Choose Happiness’ set, and teamed it up with one of our new sentiments… Just Smile! Hi! How’s your smile? I bet it’s beautiful. Smiles are just infectious, aren’t they? So today I’m hoping to infect you all with a smile and a bit of happiness. 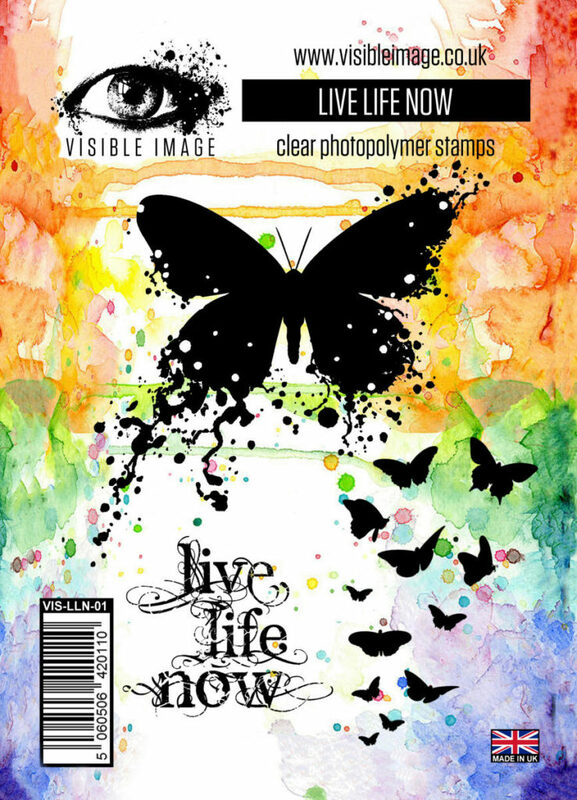 I’ve used some of the wonderful brand new sets from Visible Image Stamps. Honestly, this latest release of stamps is just incredible. 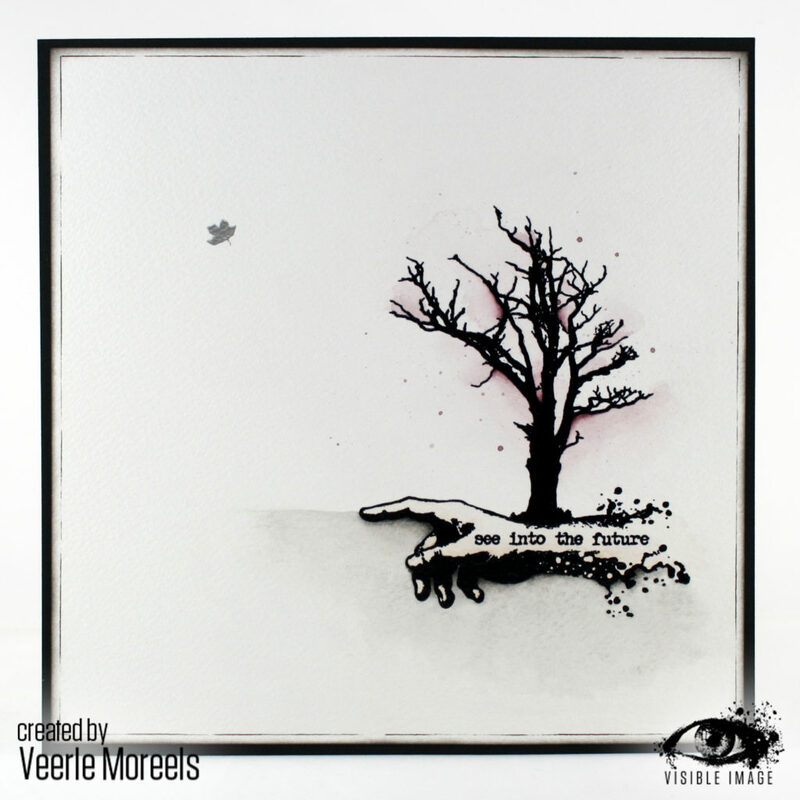 Have you seen the humming bird and the woods scenery sets? They are awesome (I have a few cards with those coming up in the future). And the sentiments are just fantastic too. I think each set is a winner. Choose Happiness. That’s the set that this superb smiley face comes from, and I tell ya, I did a little happy dance when I saw it was in my DT pack. Honestly…. I don’t think there are enough hours in the day for me to do all the ideas that have popped into my head for this set. It’s a shame that I’m on holiday for two weeks because I’m itching to play with these stamps again. 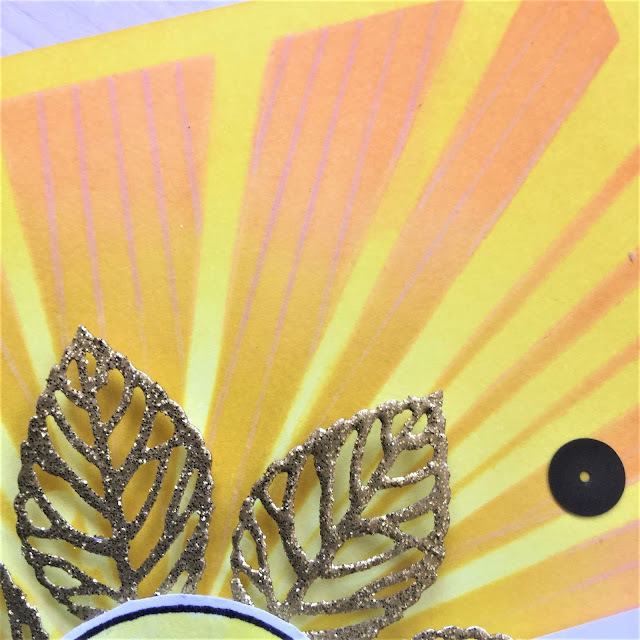 Mask the bottom portion of your card blank and blend squeezed lemonade all over the top, then blend some mustard seed in an arc at the outer edges. Secure the stencil in place then blend mustard seed, dried marigold and spiced marmalade for an ombre look to the rays. 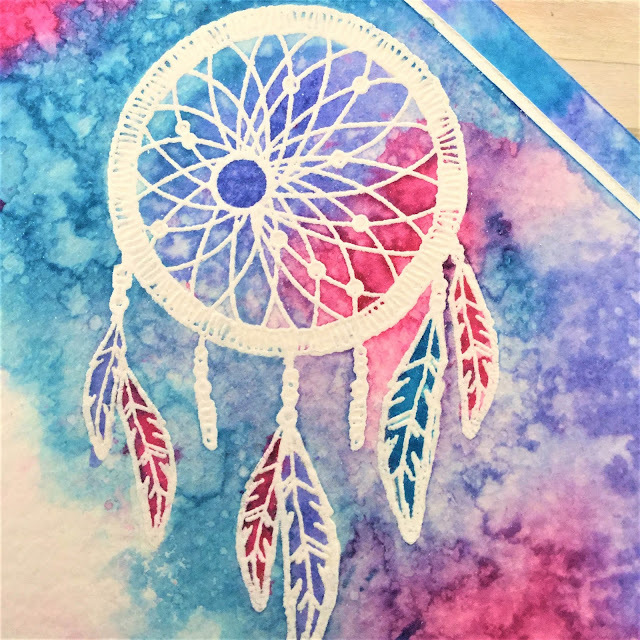 Leave the stencil in place and stamp the lines from the Shape It Up set into the rays using the VersaColor inks. You need to mask each ray separately to make sure the lines are going in the right direction. Stamp the smiley face in black ink, colour with Promarkers and cut it out. 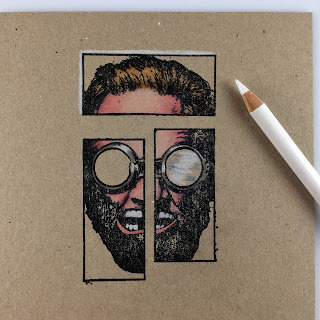 Stamp the sentiment onto a second piece of white card – leaving room for the smiley face to overlap, and attach that to the card blank with fun foam. Heat emboss the silver metal leaves with gold embossing glitter. Distress Ink (Ssueezed lemonade, mustard seed, dried marigold, spiced marmalade), VersaColor (56 Cinnamon & 182 Bisque), Versamark clear ink, Memento tuxedo black ink, Versafine onyx black ink, Promarkers ( lemon, yellow, canary, sunflower and gold), WOW! metallic gold sparkle embossing glitter, metal leaf embellishments, black sequins, fun foam. Thanks for stopping by. Have a smiley day. We love love love this card! It really does make you smile.. who wouldn’t be cheered up if they received it in the mail? Happy Tuesday and hope all is well!! Today is my first post for the Visible Image Design Team….Woot Woot!!! Here is my fun creation….. CHECK IT!!! Here are the directions for this card..
1. Create card from white cardstock. 2. 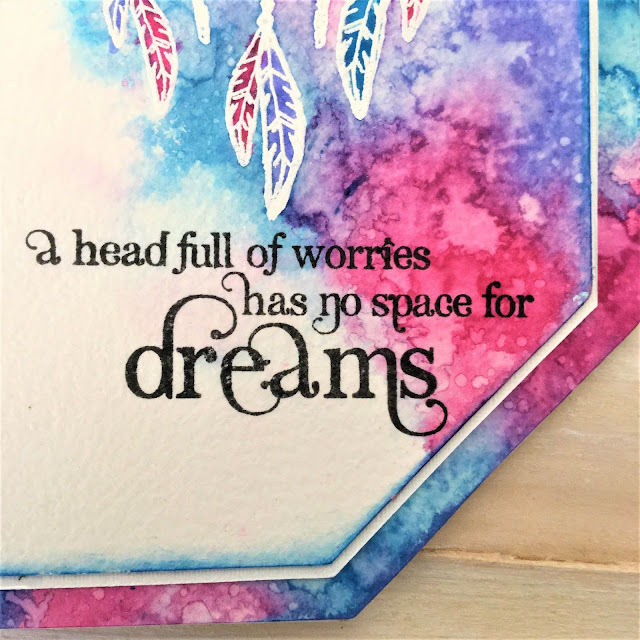 On another piece of embossed white cardstock add splatter, stamp sentiment (and heat emboss), add letter stickers and washi tape. 3. 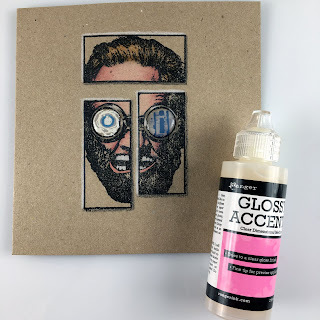 Stamp, heat emboss and cut out images. 4. Adhere images onto tag as well as adding twine and a bow to tag. 5. Adhere image panel onto card (using foam adhesive) and adhere tag onto image panel using foam adhesive. I hope y’all like this fun card!!! Thanks for stopping by and have a great day!!!!! 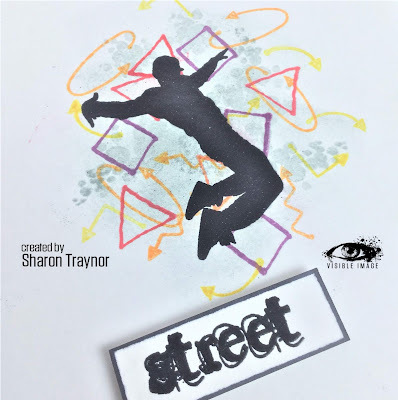 Make sure you enter anything you create with our stamps and stencils into our Facebook group ‘Show & Tell’ album for your chance to WIN a £25 coupon! And why not enter this month’s ‘make a tag’ challenge too.. for a chance to WIN a massive £40 coupon!! Pop back tomorrow to see NEW Design Team member Lanette Erickson’s gorgeous first project!